Let's try a thought experiment: Family motto! We probably all have one: The family motto. By this I mean the secret or open aphorism that expresses the family's attitude towards the world, the family worldview. I'll give you some examples. My family's motto (secret) was "You can't trust anyone but family." No, we are not members of the Mafia, but you aren't wrong to think we would fit right into those Godfather movies (except for all the crime stuff). My husband's family motto: You can never be too careful. One of my preoccupations is the permutations of class, and that is the "middle-middle class" family motto. Stay safe. Don't lose what we've attained. You're just one firing or accident away from losing our security. You can never be too careful! (From a working-class family): Don't get above yourself. An immigrant family: Where there's a will, there's a way... so if you fail, it's your own lack of will. A friend from a family with many secrets: Can you keep a secret? Sam, whose family was successful and competitive: You have to fight for what you want. Emily, whose parents were hippies: Live and let live. The friend who discovered as an adult that his father had another secret family: What you don't know can't hurt you. The glamorous friend whose mother was so elegant: Don't wear white after Labor Day. Okay! So if you have/had a family motto, or one of your characters does-- what is it? What effect might that have on how and what you write? Just remind yourself of your own motto, your family's motto-- whether or not you believe in it, it shaped you, and might be very different from your character's. You might create characters in reaction to your own family's motto-- that is, if you were raised with "don't hang out the family's dirty linen," you might create a character whose motto is "let it all hang out," but in both, there would be a preoccupation with "discretion vs. honesty" that would be something important in your life. Your characters are not, of course, you, but their "family motto" will be there in who they are and what they value-- and what they rebel against-- what causes conflict. So what's your family motto, and what was your character's family motto? And what can you do with it? Example of "motto effect." I was just reading a book that I thought illustrated something about how the "motto" helps create conflict and keep the character and plot together-- coherence. The Tenth Justice is a legal thriller by Brad Meltzer, who is pretty successful (but not like John Grisham). His stories aren't amazingly plotted, and his prose is no more than it needs to be, but I read everything he writes. Why? I think one reason is because his work is so "coherent". Everything works together to reflect what I'm getting is his sort of central belief, which has to do with, well, disillusionment. "Things are never what you expect." Or—Expect the unexpected. This motto runs through all of his work that I've read, but it's especially clear in this book, and it's reflected in all aspects. The first line is: "Ben Addison was sweating like a pig, and it wasn't supposed to be this way." Right from the start, the book reflects that idea that our illusions-- "what is supposed to be"-- will always prove to be less (less good, less bad) than the reality. So the brilliant young men come to DC to conquer the world... and they find that the world doesn't care. They have to settle for low-level jobs that don't recognize their abilities. The one young man, Ben, who gets the fancy job (Supreme Court justice law clerk), quickly exposes another illusion vs. reality. We all think of course that the decisions of the court come from the wise, experienced old justices... but Ben learns what he didn't expect-- that the clerks-- kids just out of law school-- have way too much influence on which side wins. The theme of "illusion v. reality" is carried through in the characters. Ben is fooled by someone pretending to be his friend... but that's possible because Ben is pretending to be experienced and knowledgeable when he's new at his job and knows nothing. His "voice," then, embraces that preoccupation with "disillusion" which is so much a part of his worldview. (Yeah, it's kind of pessimistic... but he also, I think, understands that as a necessary part of growing up.) So he has paragraphs where he sets up what he expected (say, that the judges are wise and powerful), and then undercuts the expectation with the reality (that the silly young law clerks actually are the ones who make and justify decisions). The "reality bites" meme influences everything from story choice (a legal thriller is all about the disillusioning effect of getting close to the justice system :) to word choice-- often I notice he chooses an unexpected word or image. He likes to play with that unattractive and unwanted "sweat" (from the first line), especially in this opening. Just an example. As you read books by an author, and they seem remarkably unified, see if you can identify the author's or character's motto as a controlling concept. Any examples? "The family that swims together... stays together." 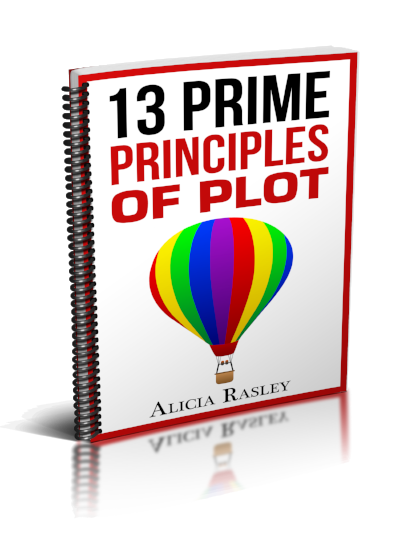 Newer PostHow Many Plot Types Are There?